A few posts back, I mentioned some spinning. It is a blue, but not quite as pale as in the picture. The roving is mostly blue, but with subtle vertical stripes of yellow, red, and deeper blue. 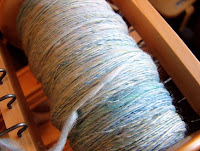 I feel in love with the roving and I am really enjoying spinning it. I bought the roving at Yarn Barn in Lawrence, but it did not indicate what type of wool. Originally, this was going to be part of the stalled skyline project (which is still in the planning stages), but now I don't know what I will make of it. I am spinning the singles now, with a 3-ply yarn in mind. 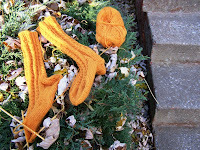 I have also been knitting a Denmark Socks from Nancy Bush's Knitting on the road. Just have to finish the last toe and weave in ends.